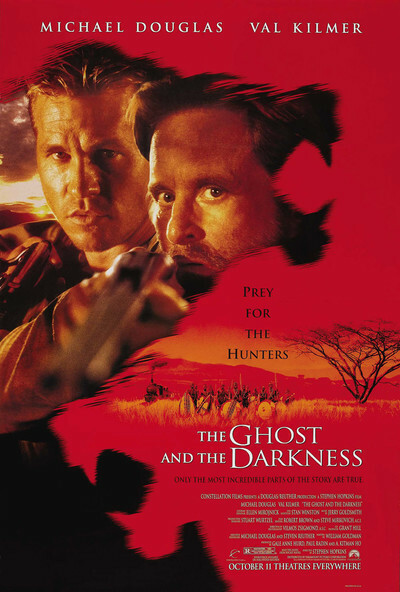 “The Ghost and the Darkness” is an African adventure that makes the Tarzan movies look subtle and realistic. It lacks even the usual charm of being so bad it's funny. It's just bad. Not funny. No, wait . . . there is one funny moment. A bridge-builder takes leave of his pregnant wife to go to Africa to build a bridge, and she solemnly observes, “You must go where the rivers are.” The bridge man, named Patterson, is played by Val Kilmer in a trim modern haircut that never grows an inch during his weeks in the bush. He soon is joined by a great white hunter named Remington (Michael Douglas), whose appearance is that of a homeless man who somehow got his hands on a rifle. If this were a comic strip, there would be flies buzzing around his head. The men meet up in Uganda, where a big push is on to complete a railroad faster than the Germans or the French. The owner of the rail company is a gruff tycoon who boasts, “I'm a monster. My only pleasure is tormenting those people who work for me.” He is too modest. He also torments those who watch this movie. Work on the railroad bridge is interrupted by a lion attack. Patterson spends the night in a tree and kills a lion. There is much rejoicing. Then another lion attacks. Eventually it becomes clear that two lions are still on the prowl. They are devilishly clever, dragging men from their cots and even invading a hospital to chew on malaria patients. “Maneaters are always old, and alone, but not these two,” Remington intones solemnly. The rest of the movie consists of Patterson and Remington sitting up all night trying to shoot the lions, while the lions continue their attacks. At the end we learn that these two lions killed 135 victims in nine months. The movie only makes it seem like there were more, over a longer period. Many scenes are so inept as to beggar description. Some of the lion attacks seem to have been staged by telling the actors to scream while a lion rug was waved in front of the camera. Patterson eventually builds a flimsy platform in a clearing, tethers a goat at its base, and waits for the lions. Balanced on a wooden beam, he looks this way. Then that way. Then this. Then that. A competent editor would have known that all this shifting back and forth would become distracting. Then a big bird flies at him and knocks him off the beam, and right into a lion's path. Lesson No. 1 in lion hunting: Don't let a big bird knock you into the path of a lion. A narrator at the beginning of the film has informed us, “This is a story of death and mystery.” The mystery is why these particular lions behaved as they did. I don't see why it's a mystery. They had reasons anyone can identify with: They found something they were good at, and grew to enjoy it. The only mystery is why the screenwriter, William Goldman, has them kill off the two most interesting characters so quickly. (They are Angus, the chatty man on the spot, and an African with a magnificently chiseled and stern face.) In the old days this movie would have starred Stewart Granger and Trevor Howard, and they would have known it was bad but they would have seemed at home in it, cleaning their rifles and chugging their gin like seasoned bwanas. Val Kilmer and Michael Douglas never for a second look like anything other than thoroughly unhappy movie stars stuck in a humid climate and a doomed production. I hope someone made a documentary about the making of “The Ghost and the Darkness.” Now that would be a movie worth seeing.